This picture of our grandmother Antonetta Vincenza (Vera) Gliatta Pacelli was taken sometime in the 1920's. The picture above is one of our favorites. Our Gandmother Vincenza Gliatta and Grandfather Dionisio Pacelli were married in May 31, 1908 in the Bronx, NY. In the photo below the girl in the picture is our cousin Camille Pucci Giaconelli. She looks to be about two years old in this picture. She was born in 1936 so we feel that this picture was taken in 1938. Vincenza's father, Leonardo Gliatta, Our Great Grandfather. The picture below is a family treasure. We would love to have a photo of our Great Grandmother! Our Great Grandmother's name was Serafina diMinno. We often wondered how she looked. The following pictures were taken when of our cousin, Leonard Gliatta (Matteo's son and Leonardo Gliatta's grandson) visited Greci in the late 1950's. In the picture above from L to R - Leonarda Maraia, Leonard and Nicola Gliatta and Carosena Maraia. Leonarda and Carosena's children are in the front. 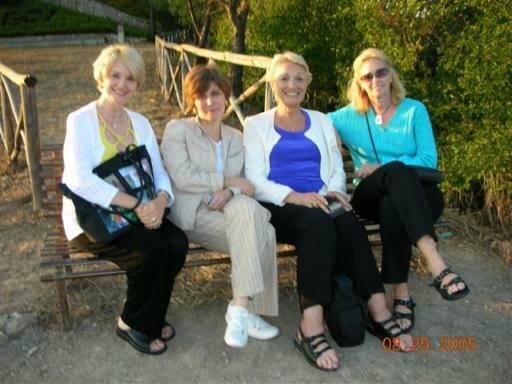 Leonarda and Carosena are Nicola and Carosena D'Amico's granddaughters. In the Picture below: Carosena D'Amico, Leonardo and Nicola Gliatta standing and Vincenzo Gliatta, one of Nicola's and Carosena's sons, is kneeling in front. In the picture above: Michele, Nicola and Leonard Gliatta. Michele now lives in Canada. This is a picture of (from left to right) Teddy Aiello (Violet's father), Sarah Gliatta Pucci (Matteo Domenico Gliatta's daughter), Emanuela Ierubino (Silvio's wife), Silvio Gliatta and Silvia Rosa Gliatta (their daughter). Silvio was our Grandmother's nephew. He passed away in 2006 in Foggia. Silvia still lives in Foggia with her family. She is an English teacher! She owns two houses in Greci - one of which is the house my grandmother was born in and where she lived until immigrating to New York in 1906.The picture was taken in New York. This is a confusing story....you won't believe it!! Silvio was a butcher and opened a butcher shop in Boston when he immigrated from Greci. Silvia was actually born in Boston. After a few years Silvio decided he was homesick and decided to move his family back to Greci. Then....after a couple of years his wife, Emma, wanted to return to the U.S. so they moved back to Boston. Silvia told me that it was very, very difficult for her because she had forgotten her English and only spoke Italian. When she went to school she said the kids made fun of her (kids can be so cruel!). Of course in time she re-learned English. Then....Silvio wanted to move back to Greci again....so away they went!! This story doesn't end there ~ this is amazing....Emma wasn't happy in Greci and wanted to move back to the U.S. Silvio wanted to stay in Greci....so, they let Silvia decide. Silvia remembered how cruel the kids had been to her the last time they moved to Boston so she chose Greci. So, that's where they stayed. The picture was made when they were living in Boston and went to New York to visit the family. Silvia was born in 1959 and to me it looks like she was about 5 years old so it was probably taken about 1964. Of course I'm just guessing but I'm probably not that far off. The following two photos were taken during the St. Bartolomeo festival in the Bronx. The first one is our Grandma, Vincenza Gliatta Pacelli and my aunt Sally (Serafina Pacelli). The second picture is of my Aunt Sally who played the Queen in the drama. The young girl who played the Kind and Queens daughter (we do not know her name) and our Great Uncle, Matteo Domenico Gliatta who played the King. Sherry's Mother, Lois Pacelli and Father, Alfredo Pacelli. Sherry is the the arms of her father. This is a picture of Violet with her late husband. Placido (Sonny) Milone.